Innova ITX9600 Inversion Therapy Table - 300 lbs, 4'10" - 6'6"
The Innova ITX9600 inversion table may not immediately stand out to you due to its fairly conservative design. However, you only need to take a look at the buyer reviews in the next tab, to see that it is considered a good quality table at a low price. You will also likely be surprised at just how many have left a review for this very popular table. The Innova ITX9600 is able to hold a maximum weight capacity of 300 lbs and is suitable for users between the heights of 4 ft 10 in – 6 ft 6 in. One of the main highlights of this table is how adjustable it is, it also has a great inversion limiting device that we will take a look at below. A comfortable padded backrest is a fairly common feature on inversion tables these days, however the addition of an adjustable headrest is something rarely found! 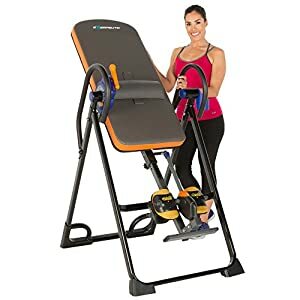 The adjust-ability of this inversion table is (as mentioned earlier) one of the best things about this particular table. As with all inversion tables can you control the height of the table to match your specific measurements. However, the Innova ITX-9600 also allows you to adjust the headrest and the footrest, to ensure you can easily find the true center of gravity no matter what your body proportions are. As you can see in the image to the right, all 3 of the adjustable features are labelled. 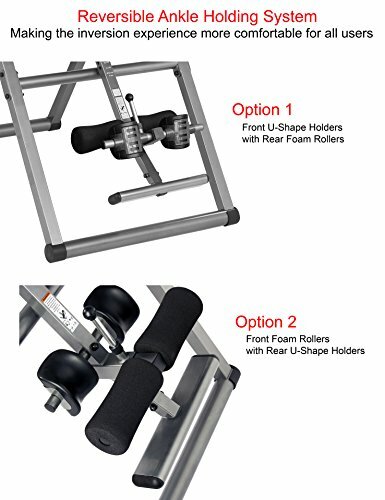 You will also notice that the image states the majority of inversion tables only feature one adjustable feature (user height). 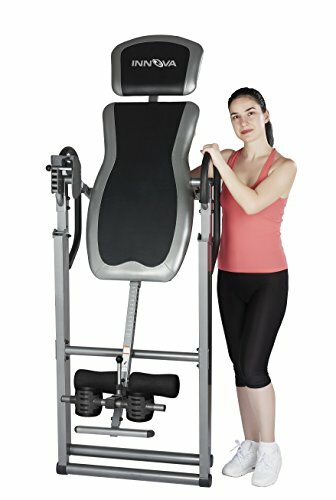 If you have ever tried using an inversion table that is set at the wrong height for your body proportions. You will know how much harder it can be to invert. With this table you can really dial in on the adjustments to make inversion completely effortless. 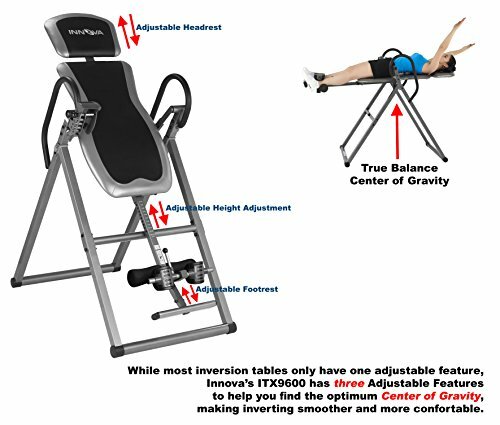 Rather than opting for the tether strap system found on so many inversion tables, the Innova ITX 9600 inversion table features this great looking pin system. While there isn’t a huge advantage to having a pin system over a tether strap. A pin system is likely to be a little less hassle to use and adjust. Also due to the pin system being a more ridged inversion angle restriction device, you can quickly get a good idea of what inversion angles are more preferable to you. As you can see in the image, the pin system allows the user to invert up to the angles of 15, 30, 45, 60 or 85 degrees. To adjust the angle you simply pull out the circular pin and place it within another selection hole. 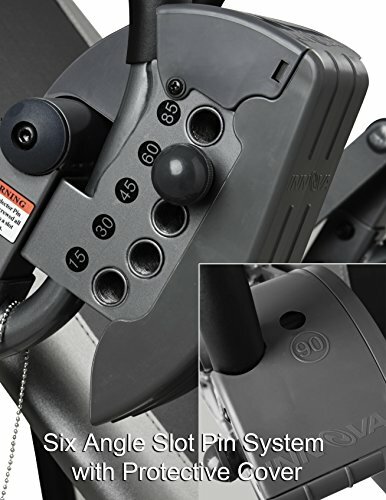 If you decide you do not require any angle limitation, you can simply remove the pin from the side selectors and place it in the 90 degree selector at the top of the device. Thus allowing for complete unrestricted inversion! Angle limitation is a great idea for inexperienced inversion users to gradually built up confidence on a table. It is also very useful if you are not a fan of inverting fully! If you are quite unfamiliar with inversion angle limitation devices found on inversion tables, you can take a look at our features page here where we take a look at each in a little more detail. The ankle system on the Innova ITX 9600 is fairly standard in design, although you can reverse it to suit your preference. The ankle system features molded cup holders on one side and foam rollers on the opposite. The majority of inversion tables tend to have the molded cups positioned at the back to support the back of the ankles. However if you prefer you can adjust the supports so the rollers are positioned at the back. For most this probably will not be a feature that is particularly worthwhile. Although some may have a preference after they experiment with both settings. 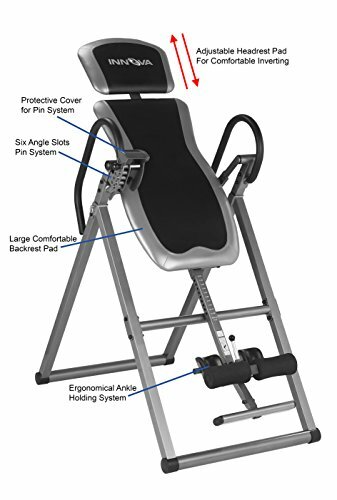 To secure the ankles in place this inversion table has a fairly standard spring pin adjuster. Aside from the fairly long side handles which are useful for when returning to the upright position there are no other notable features to mention. Is the Innova ITX9600 A worthwhile choice? 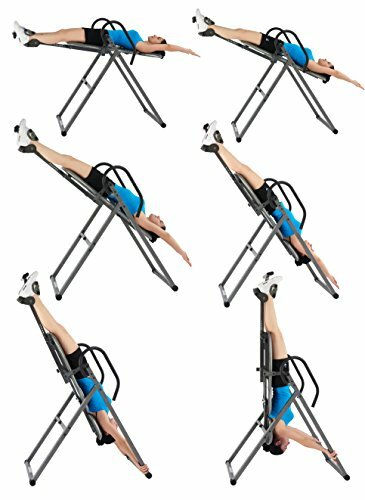 As you now know this rather simple looking inversion table actually possesses some very useful features. 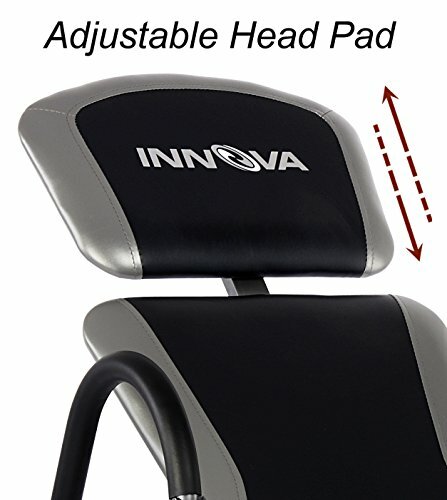 These additional features alone make this inversion table from Innova an excellent choice! In addition to this the low price is also a perfect reason to consider this table. 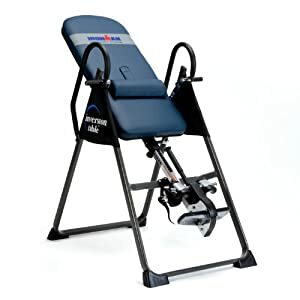 If you are on a budget this is an especially good inversion table to choose. 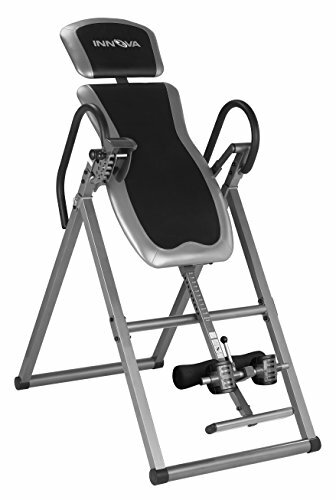 It is also a great entry level inversion table for those who may not know if inversion is right for them, since it is often available for half the price of other inversion tables on the market. The buyer reviews for this table are mostly exceptional, and there are a lot of them to go on. You can take a look at them all in the next tab or on visiting the retailer.